10th November 1984. My 10th birthday. The first time I went to Upton Park. My dad took me to the game as my main birthday present that year and we drove up to East London from Kent, parked the car on one of the streets just south of the Barking Road and walked up towards the stadium. There were loads of fans queueing up outside Nathan’s and we joined them to get some chips before we headed to the ground itself, making our way up Green Street to the main entrance. The club shop at that time was just a portakabin outside the west stand, not having a lot of money, I bought myself a small pin badge in the shape of the West Ham crest, which I still have to this day. After purchasing programs we entered the stadium and took our places on the North Bank behind the goal. This was the first time I’d been in a crowd so big and the atmosphere was incredible. It wasn’t long before ‘Bubbles’ was being sung among the crowd and I tried to join in, just about remembering most of the words I’d been taught by my dad. The game itself didn’t end happily for us as Everton, our opponents that day, won the game 1-0. But that didn’t matter to me, I’d been to see West Ham play. I wouldn’t get to many games over the next thirty or so years, either due to age, time, work or money. There was a green period during my time at University in the early 1990’s when I was studying at the University of Greenwich. I was living in and around Woolwich and so I would walk to the ground via the foot tunnel, a journey that took around one and a half hours. You’d end up walking with slowly more and more people as you got closer to the stadium and you’d end up being swept along in the crowd. 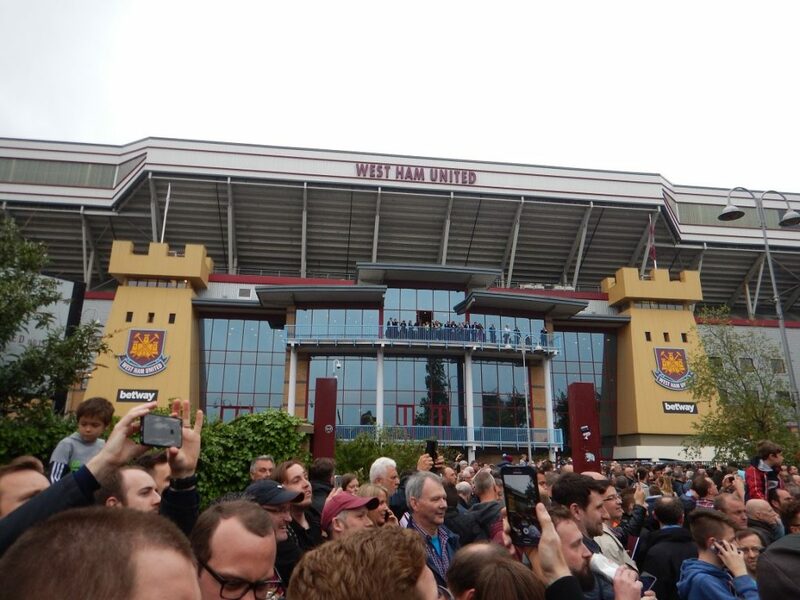 Although I’ve not been there as much as I would have wanted to over the years, I’ve got some great memories of games at the Boleyn. I’ve seen Championship play-off games, the Bobby Moore testimonial. I took The Wife to her first ever football game there (she doesn’t really like football!) and I’ve seen some exciting games, most recently the last-minute-extra-time-winner against Liverpool in the FA Cup. Three years ago I got to return the favour to my dad when I took him back to Upton Park for his 70th birthday to watch us beat West Brom 3-1. It had been many years since he’d been there, he’d grown up around the area, and so he was amazed at the change that had happened to the community over the years. 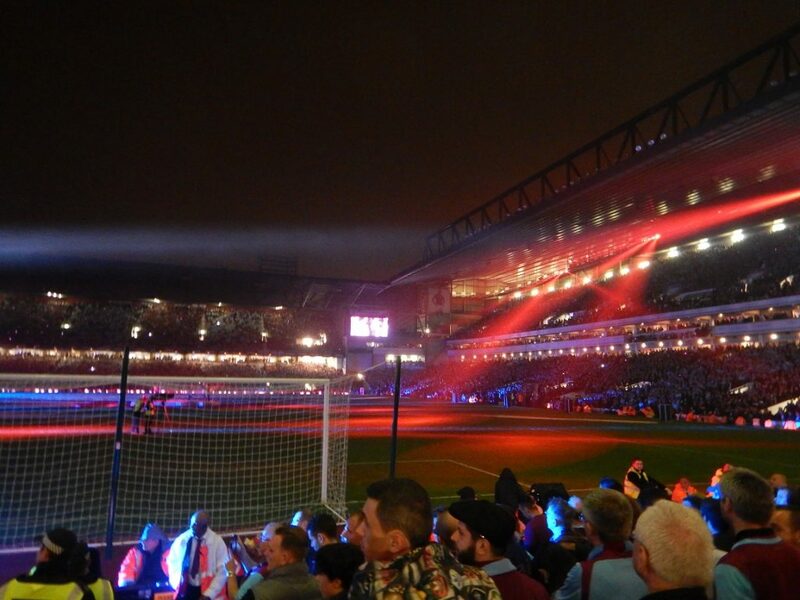 Last night The Boleyn Ground hosted her last ever West Ham game as we played Manchester United. I was lucky enough to get a ticket for it with a front row seat right behind the goal, and it turned out to be another one of those epic nights under the lights in East London. The atmosphere in and around the ground was electric, the place was buzzing with all fans in jovial mood. West Ham took the lead after only 10 minutes, then went behind 2-1 in the second half but scored two late headed goals to claim a historic 3-2 win. At the final whistle the place erupted and after the players did an end-of-season lap of honour there was a whole celebration of the history of West Ham and Upton Park with former players being brought out to celebrate with the fans. It was an emotional evening and one that will be remembered for a long time.